Here are some garage pegboard ideas to help you see some ways you can use pegboard to hang and organize a variety of stuff in your garage. Here's a picture of a 6x4 piece of pegboard. 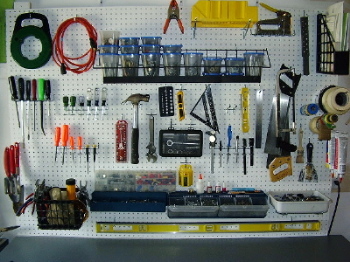 Although it shows how well pegboard can be used to organize tools and hardware, it's also important to note that pegboard is not limited to tools and hardware. You can also use it for coats, hats, gloves, kids' sports gear, bicycle helmets, backpacks, etc. Hooks can hold tools such as drivers, hammers, cutters, wrenches, pliers, small socket sets, and different kinds of tape rolls. They can also hold small garden tools such as hand shovels and hand rakes. Many tubes of caulk, adhesive, and spackling paste can also hang from hooks. The phenomenon is... install a hook and it wont stay empty, which means less clutter laying around your garage. Miscellaneous items like small hoses, extension cords, equipment maintenance parts, bungee cords, rope, chain, and wire can all be hung on hooks. Baskets are good for storing measuring devices like electrical meters, rulers, tape measures, squares, laser levels, and calipers. Another good use is for sports equipment. Such items include things like balls, pucks, gloves, roller blades, bats, and protective gear. Also, work gear can easily be stored in a pegboard basket. This includes different kinds of gloves, safety goggles, earplugs, and a garage first aid kit. Baskets add a lot more functionality that broaden the scope of possible pegboard ideas. These are containers for holding relatively small things. Unlike baskets, they have a solid bottom, solid walls, and sometimes even a lid. Some pegboard ideas for bins include storing household hardware. This is stuff like thumbtacks, nails, screws, and various nuts, bolts, and washers. Theyre also good for storing small plumbing and electrical fittings such as pipe and conduit fittings, valves, switches, and receptacles. Pegboard bins are also a good place to keep project markers. These are items such as Sharpies, crayons, pencils, and pens. Also bin-able are small straight-edges, handheld calculators, and compass sets, which are all good fillers. Pegboard bins are incredibly useful, but remember that organizing tiny things is tedious and time-consuming! Another idea is to use pegboard literature displays to store stuff like auto and appliance manuals. Those of you who work on vehicles in your garage will especially appreciate an easily accessible, and out-of-the-way solution for dealing with garage manuals. This is one of those pegboard ideas you can really use your imagination on. Generally, they're good for storing stuff like notebooks, information folders, user guides, magazines, and formula charts. Pegboard shelves are good for things like, like lubricants, adhesives, spray-paint cans, flashlights, batteries, and any other small items that really cant be hung from a hook. If you have a clothes washer and/or dryer in your garage, you can use pegboard shelves to organize and store fabric detergents, softeners, bleaches, linen, or other laundry items. Another thing you can store on a pegboard shelf is a piggy-bank... perfect for collecting stray change around the garage. either 1½ or 2. The number of holes and hooks you need depends on how long you want the shelf to be. Next, install the straight pegboard hooks snugly into the 1X4 holes, then install the shelf on the pegboard. The straight hooks give the shelf just enough slope to prevent things from falling, sliding, or rolling off. You can also use pegboard as a garage pegboard organizer. This is one of the fastest, easiest, and least expensive pegboard ideas for shelving your garage.